BELOIT, Wis.— Patch Products had family fun in mind when developing the fast-paced new games Stinky Pig™ and Yowza!™. Both inspire enjoyable together time for families. 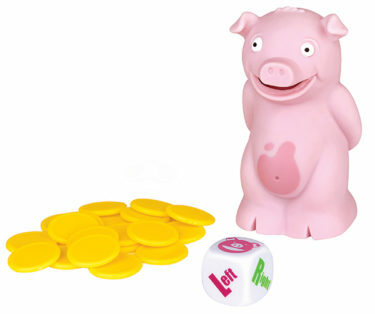 Poke Stinky Pig’s belly to hear him sing, and then roll the die to see which way to pass him. Do it fast…pass him left, pass him right, roll again…but hurry before he…toots! If you’re holding Stinky Pig when he passes gas, you must take a token. But then keep playing…quickly…and the player with the fewest tokens in the end wins! For two or more players, ages 6 and up. Zap, Zoom, Boom, Bam, Wham…Yowza! You Gotta Say It to Play It™ in this quick discarding game. Chant along, and if the card you discard matches the word you just chanted, then you get stuck taking the discard pile! If you discard a “wild” card, you get to keep going…but at your own risk! Just be sure you’re the first to get rid of all your cards so you can be the winner…Yowza! For two or more players, ages 7 and up. Stinky Pig and Yowza! join Patch’s line of family and children’s games, including the 2013 TOTY (Toy of the Year) finalist Don’t Rock the Boat™ and 2014 TOTY finalist Chain Letters®. Patch Products is a family-owned company, leading the toy industry in design, manufacturing and marketing of games, children’s puzzles, preschool toys, creative activities and teaching tools. Top-selling brands include 5 Second Rule®, Perplexus™ Don’t Rock the Boat™, Farkle, The Game of THINGS…®, Mirari®, Buzzword®, Stratego®, What’s Yours Like?®, Lauri® and Wooly Willy®. Patch focuses on innovation through building brands and creating new categories.